Jacob David Sudol writes intimate compositions that explore enigmatic phenomena and the inner nature of how we perceive sound. 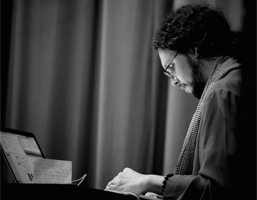 He currently is an Assistant Professor of Music Technology and Composition and the Coordinator of Music Technology area at Florida International University in Miami, Florida. He was awarded a Fulbright Scholar grant for Taiwan for the Academic 2015-16 Year. He holds a Ph.D. in composition from the University of California, San Diego where his mentor was the Grawemeyer Prize-winning composer Chinary Ung. Jacob Sudol has been commissioned and/or performed by many prestigious ensembles and performers such as the Nouvel Ensemble Moderne, Chai Found New Music Workshop, Jennifer Choi, Mari Kimura, Contemporary Keyboard Society, Little Giant Chinese Orchestra, the McGill Contemporary Music Ensemble in collaboration with the McGill Digital Composition Studio, FIU Laptop and Electronic Arts (FLEA) Ensemble, pianist Xenia Pestova, cellist Jason Calloway, percussionist Nathan Davis, flutist Carla Rees, the rarescale duo, flutist Solomiya Moroz, pianist and composer Chen-Hui Jen, pianist and composer Keith Kirchoff, clarinetist Krista Martynes, guzheng-performer Yi-Chieh Lai, percussionist Fernando Rocha, percussionist Luis Tabuenca, and pianist William Fried. These works have received numerous domestic and international performances. Jacob Sudol also frequently performs his own works for instruments and electronics in diverse settings such as the Music at the Anthology Festival, Issue Project Room, SEAMUS Conference, Rice University, Domaine Forget Festival of New Music, Taiwan National Recital Hall, INTER/actions Symposium on Interactive Music, International Computer Music Conference, Felix Mendelssohn Bartholdy Concert Hall in Leipzig Germany, Studio for Electro-Instrumental Music in Amsterdam, International Society of Contemporary Music New Music Miami Festival, FIU Electro-Acoustic Student Festival, Miami Beach Urban Studios, Atlantic Center for the Arts, Art Basel Miami, Cluster Festival of New Music, The Spectrum in New York City, Bowling Green University, The Center for New Music in San Francisco, McGill University, Wesleyan University, the California Institute of the Arts, Art Basel Miami, Florida International University, Bangor University, Mills University, Taiwan National Chiao Tung University, the University of California at San Diego, and the wulf in Los Angeles.